The Cat in this scenario is Cat Rambo, my Technicolor-haired friend, fellow writer, and mistress of the internet. She has just released a book called CREATING AN ONLINE PRESENCE. I get asked a lot about what advice I would give to writers, newbies and professionals alike. While my answers rarely stray from “Never Stop Writing” and “Finish What You Start,” it’s no secret that in this day and age, an Online Presence is TOP PRIORITY. This is the way you will raise your visibility, reach readers, and grow your fan base. Just like exercise, you will get out of it what you put into it, so LEARN TO LOVE IT. There are so many different sites, there will be SOMETHING that strikes your fancy. Try them all. 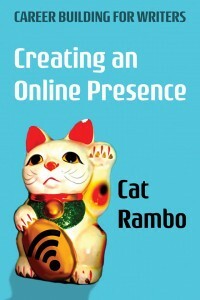 Cat’s CREATING AN ONLINE PRESENCE covers the basics of creating and maintaining an online presence for writers. What you need on a website, how to effectively use social media, how to find readers via social media, what free resources are available to writers, whether it’s worth it to pay for online advertising, and, most importantly, how to promote yourself online without using all your valuable writing time. Right now it is available in e-book form (only $4.99 on Kindle! ), but check back — it will be available soon as a tangible copy as well. This entry was written by Princess Alethea and posted on November 21, 2013 at 7:50 am and filed under Friends, writing. Bookmark the permalink. Follow any comments here with the RSS feed for this post.